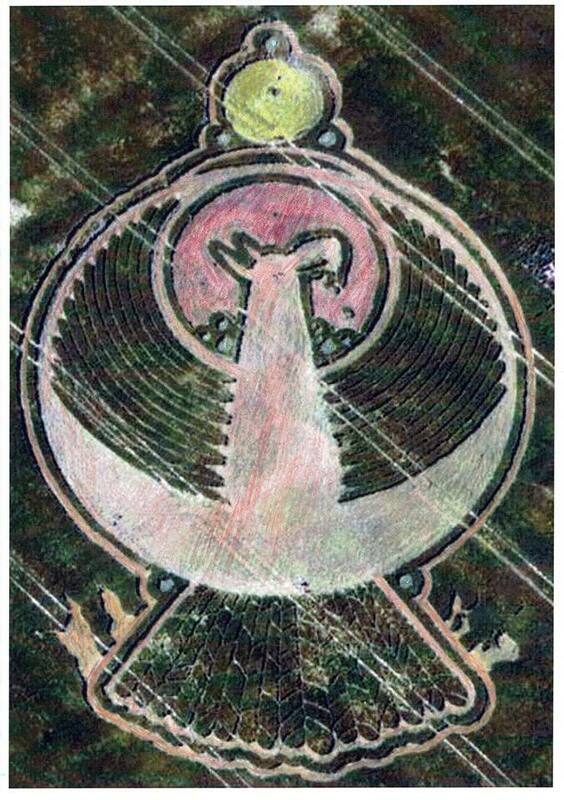 This crop circle was found in Cherhill, Wiltshire, UK, 12 June 2009. Translated by Suzanna Maria Emmanuel, with the strong guidance from Halisarius, Leader of the Galactic Federation of Light Society. Universal history is rich with stories and adventures of so many star races that we cannot possibly imagine or understand about at this present moment with our consciousness. Here the image from the stars shows how significant the history has been, and also how important it is to awaken. We are far from on our own. There are universes which have always been in the great love, and there are also universes which resisted the great Divine Love in the universe and wanted supremacy for self, sovereignty for self. It constantly fought against the light universes, as if it was a ferocious beast, which is well depicted here, swallowing the light universes with its sharp beak, eating all that it could to grow larger and larger in power, laughing at its victories, powering up greater and greater with its ferocious flames of anger and hate within its belly, with dangerously sharp spikes that would truly get anyone who stood in its way. When you listen to the stories of Caeayaron, and Halisarius, Galactic Federation Leader, you will hear the teachings being spoken of the great galactic battles. There was one planet in particular that was the great light planet where all creation was created by the Light Beings, and all dimensions were created upon it too to allow greater universes to come into existence. Its existence was beautiful and hidden, far away in the greater spaces. It was a treasure cove, filled with the greatest secrets. The darkness found the planet and seized it. It claimed it as its own and lived upon it. However, the light planet did not do all things that they wished it to do. It could not as the darkness did not harmonize with the higher universal frequencies. It could only act on the frequencies of the 'current owners' of the planet. The darkness surrounded this light planet with its field of great anger, and dragged the whole planet down into denser dimensions, bringing down the dimensions of all the other star beings also (as shown by its wings). The darkness grew strong and mighty upon it and raided other universes, mining them so that they could build greater technology to grow in strength and might to rule many other planets. A solution needed to be found. Please listen to the teachings up on you tube about this planet. You will hear that the Light Grid Programmers went to that planet and placed light within it. The darkness, hating the light, blasted the light grid programmers out and blasted a part of its own planet out deep into the universe not wanting to be infected by the light. This became our planet earth. Several of its planets came along with it, and they are still there too in our own Milky Way system. Please know that the greater flows of love will return to our spaces and then it will truly be ‘history,’ a ‘story’ of our entire galactic history. It will be completely gone once mankind come to the great love with Divine Will. Because the violet flame is becoming stronger upon our earth, it is like an explosive energy for the darkness, and whenever we call in the violet flame, the darkness also receives it greatly. * The old universes wanted greater power and received greater power and control by overtaking many of the universes. It built greater power and wanted to dominate the whole universe and rule the whole universe. * The eagle like bird represents all the power of the darkness. It builds power by eating the universes. * The blue circles represents the blue universe of peace and love and how the darkness ‘gobbled’ up many of the peace universes to gain more power. * The blue circles around the light planet also shows how the blue universes tried very much to protect their precious planet of light which was so important to the whole universe. * The red circle around the eagle like head represents the red universes that were put into place to defend the blue universes and to allow balance to come to the great universe. * * The darkness took over many of the red universes and celebrated its victory. * Now it was able to reach the greater light planet, as shown at the top. This was the planet with all the power to build the greater universes. * In doing so, all the star realms that were still existing dropped dimensions as symbolized by its wings. It took everything down. * The tail of the bird shows the fallen dark dimensions and the orange flames shows the ferociousness of the darkness and how determined it was to win the game. Please understand that our earth was created to bring balance and love back to all the universes and that the darkness can do nothing to us anymore. Our plane has been energetically cleansed now so that we can rise to the great light to bring all universes into balance, for this is why the Lemurians came to this sacred plane, earth. When we ascend through the Divine Pineal Gland Activations by CAEAYARON, MAGNETIC MASTER, then the darkness has to convert to the Light. This is why it is now important to awaken to our Sacred Light Codes, the codes we were given in Lemuria, and the only way to awaken to them and connect to them, is through CAEAYARON, The Sacred Archangel who holds the Sacred Light Codes for our greater release upwards collectively. Please join Suzanna on her facebook page to find out much more on the Divine Pineal Gland Activations and to receive loving guidance from the Great Divine Realms of Great Love.